THE FILMED CONCERT WAS A SELL-OUT, recorded at the Shepherd's Bush Empire on 2 December 2005, and has been described as The Stranglers' greatest ever live gig. The Stranglers' line-up is: Jean Jacques Burnel; Jet Black; Dave Greenfield; Paul Roberts; Baz Warne. The Guildford, Surrey, band was formed in September of 1974 as a pub rock group but they later branched out to explore other styles of music using psychedelia, Doors-like keyboard and the driving aggression of punk and new wave. Finally settling on the style for which they are universally known  and that takes the best of all The Stranglers' musical ventures  the band quickly had an album full of classics under their belts, including the terrific No More Heroes and Peaches. Now that the great tunes, the driving bass lines, the melodic guitars and the intricate keyboards had come together, The Stranglers promoted their individuality and their talent while cornering the market in black leather. Very un-PC maybe, but that was part of the package. Even when Hugh Cornwell left The Stranglers, the band still would not be tamed and, even after Paul Roberts took on lead vocals, the enfants terribles went from strength to strength. This hard-driving, aggressive band still sells-out venues all over Europe but conversely it is with gentler melodies such as the beautiful Golden Brown and Strange Little Girl where they have enjoyed some of their greatest successes. The Stranglers On Stage On Screen DVD is representative of the band's work across the board. Check out the acoustic set and tracks from the last album, Norfolk Coast. The Stranglers On Stage On Stage is spellbinding: from the moment the band storms onto the stage, the audience is enthralled and the band performs with all the energy and passion they have always had. Enthusiastic cheers greet such wonderful offerings as All Day And All Of The Night and the delightful Big Thing Coming. The Stranglers' ethos is to work hard and play hard; conversing with the appreciative crowd between splendid tracks that include the magnificent Lost Control and No More Heroes, and The Stranglers' fine version of Walk On By. Throw in the stirring Burning Up Time and The Stranglers' repertoire proves their versatility as the band plays both an electric and an acoustic set. The Stranglers On Stage On Screen is Produced by Robin Bextor and Sanjay Kumar and Directed by Robin Bextor. 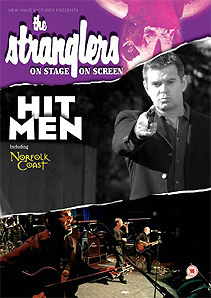  The Stranglers On Stage On Screen includes the film Norfolk Coast and is available now on DVD (released 8 December, 2008). Cat No: NW800003 | Barcode: 5060000800036 | RRP: �14.99 | Cert: 15 | Running time: 126 minutes (total). Accompanying the music is the mini-feature film Norfolk Coast, shot in 2006 entirely on location in Norfolk and London. A rough cut version of the film premiered before 2,500 fans at the Shepherd's Bush Empire but had its full premiere at the Cannes Film Festival in 2007 and it has won various awards at film festivals worldwide. It is a dark, and at times extremely uncomfortable, film about disturbed, 43-year-old Warner Tucker (Jean Jacques Burnel) who suffered from an abusive childhood involving black magic. In an effort to blot out the nightmares that haunt him, and blaming his father Tucker (Nicholas Ball) for not protecting him when he was a child, he turns to drink. His estranged wife Wendy (Lynsey Baxter) and his cousin Linda (Susannah York) shared his childhood and he is determined not to allow this horrific past to affect his young daughter Carrie (Millie Gallimore). But Wendy, who suffers bouts of depression as she tries to deal with her own demons, has had enough of the way Warner behaves as a result of his childhood and walks off, never to return. Her body is found some time later by trawlermen. All of those involved with the Satanic rituals bear a strange mark on their necks and when Warner spots the same mark on his own daughter's neck he completely loses it and wants to put a stop to the perpetrator once and for all. The film contains weird and grotesque images that are disturbing in themselves but Warner belongs to an organisation called Satanic Ritual Abuse Survivors and the film explores the different ways in which abused children react. Warner and Wendy find their lives impossible in varying degrees but Linda has apparently put it all behind her and has become philosophical, urging Warner to make things right with his father. Norfolk Coast is Produced by Sanjay Kumar and Written and Directed by Robin Bextor. Director of Photography is Michael Miles and Music is by The Stranglers, including Dutch Moon and Tucker's Grave  the film was inspired by the band's album Norfolk Coast. Additional music is by Marcus Daborne. The Norfolk Coast CD is available on EMI Records.